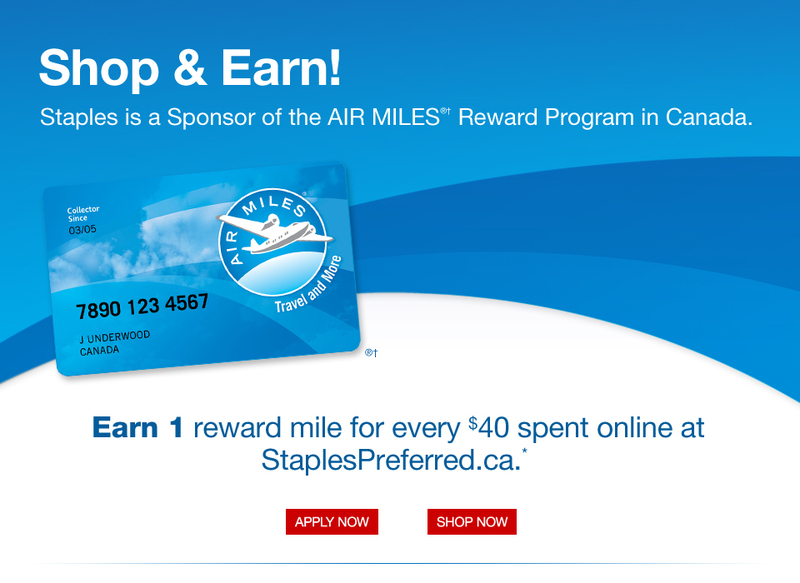 Terms & Conditions: *Earn 1 AIR MILES reward mile for every $40 spent in a single transaction at StaplesPreferred.ca after all discounts and exclusions are applied. Exclusions include but are not limited to: all taxes, delivery services, assembly services, all gift cards, self-serve copying, charitable donations, electronics levies, environmental and other third-party fees. Other exclusions may apply. AIR MILES Collector Card must be included at time of purchase. STAPLES® and Make MORE Happen™ are registered trademarks of Staples, Inc., used under license by Staples Canada Inc.
®†™† Trademarks of AIR MILES International Trading B.V. Used under license by LoyaltyOne, Co. and Staples Canada Inc.